Today’s blog comes courtesy of Jennie Bond. 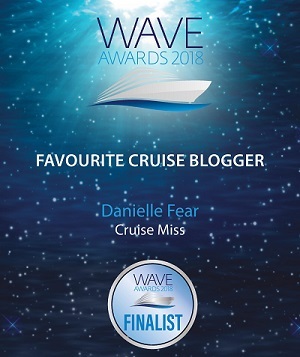 You might remember Jennie as being the former royal correspondent for the BBC and from her appearance in ITV’s ‘I’m a Celebrity’, but when not hard at work, she enjoys life on the high seas just as much as we do and today, she shares with us some stories from her cruises with Cunard, Azamara and Uniworld. I was lying on a beach in Antigua the other day as you do, when I heard a bloke on a nearby sun lounger pointing out to his wife the islands of Barbuda, St Barts, and St Kitts and Nevis on the horizon. “That’s why the Caribbean is such a great place for cruise ships,” he said. “There are just so many islands to explore.” She looked unimpressed. “You know perfectly well that I can’t stand the idea of cruising,” she said, settling back down on her lounger, book in hand. And that’s how I once felt. Many years, and many cruises, ago. There are so many misconceptions about life on a liner. People imagine that you’ll be living cheek by jowl with thousands of strangers and be corralled into jolly group activities and party games, like a band of happy campers. The truth is that you can often find yourself virtually alone, sipping an after-dinner brandy in a quiet lounge, while a harpist plays soothing music. Or you could be in the theatre watching a comedian, a magician or a fantastic dance performance; you might be in the ballroom pretending you’ve just won the Strictly glitter ball yourself, or just relaxing in the privacy of your cabin. You can tailor a cruise to suit your personal taste. The choice of ships and variety of voyages is increasing every year. That’s because more and more people are discovering that cruising takes all the strain and stress out of organising a holiday. I guess my husband, Jim, and I qualify as veteran cruisers these days. I’ve lost count of how many wonderful adventures we’ve enjoyed over the past 20 years. We’ve voyaged on big ships and small, tall ships and riverboats; we’ve crossed the Atlantic, navigated the Panama Canal and sailed the Timor Sea. 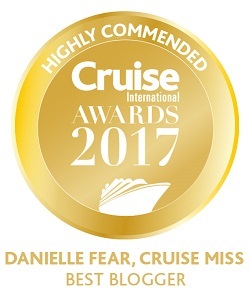 I’m lucky enough to be an ambassador for the cruise experts, ROL Cruise and tapping into their knowledge is an absolute must. 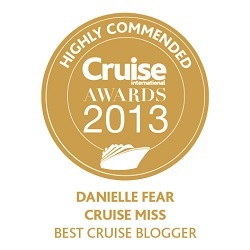 They know what’s new on the market, where the best deals are and, most importantly, which cruises would suit me best. Last year, we began with a magnificent voyage on board Cunard’s Queen Victoria. Cunard ships ooze class and elegance. I’m not a great one for dressing up, but there is something rather special about swishing down the staircase in a full-length gown for dinner. Of course, that’s only on “formal” nights, of which there are just two or three. Other nights are much more relaxed. We sailed from Darwin, in Australia’s tropical Northern Territory, through south-east Asia to Singapore. At every port, the sight of Victoria waiting for us majestically as we returned from a steaming hot shore excursion, was like manna from heaven. The ship becomes your temporary, very luxurious, travelling home. And, every morning, the most magical thing happens: you draw back the curtains and discover that a new country or island has come to visit you. And all you’ve done is enjoy a fabulous dinner, some fine wine and excellent entertainment. Victoria carries 2,000 guests and 900 crew. That’s a lot of people, though not in the same league as the capacity of some of the super liners. But we never find that it feels crowded or overwhelming. If, however, you feel more comfortable as part of a smaller community, I can highly recommend Azamara’s two ships, Quest and Journey. Each carries just over 650 passengers and has the feel of a big, extremely flash, house party. From the Captain down, the crew are very much in evidence and cannot do enough to make your stay on board the best possible experience. Drinks are included and the wine is good quality; you find you are constantly being offered a snack, a cooling flannel, a towel or an ice-cream. Last year, we joined Azamara Quest in Miami and sailed through the Caribbean – probably my favourite winter destination in the world. In St Maarten, the ship laid on one of their special events. On every cruise, they offer all their guests one bespoke occasion. When we were in Turkey one year, they took us on an exclusive evening tour of Ephesus and treated us to a private classical concert in the small amphitheatre. It was enchanting. This time, we were drummed ashore by a twenty-strong Caribbean band in colourful costumes. And then we enjoyed an open-air concert by an electric string quartet, followed by fireworks over the ocean. It was fantastic! But there’s always something new to explore in the cruise world. And last year, in between our sea voyages, we tried out a river cruise on board Uniworld’s SS Antoinette. It had been a long-standing ambition of my husband to sail down the Rhine and, rather bizarrely, to see for himself a small car ferry at a town called Linz. Don’t ask me why, but, for some years now, he has enjoyed studying the webcam of the Linz ferry as part of his morning routine. And this was his chance to catch a glimpse of the vessel in real life! Our river trip took us from Basel to Amsterdam, past fairytale castles and magnificent countryside. The ship was far more spacious than I had imagined, the decor was lush and the overall feel luxurious. The food and wines were excellent and the shore excursions – all included in the price – were varied and highly informative. I love doing things that seem completely off the wall… like going on a vinegar tasting tour. Well, it turned out to be absolutely fascinating; we had to don monk-like, protective robes to inspect the ancient barrels (they were being protected from us, not vice-versa) and we sampled some of the finest vinegar in the world – which can all be served as aperitifs or digestifs and which allegedly carry medicinal qualities. There’s much more to see and do on a river cruise: you can find yourself sailing past quite large cities and there are things to watch on each bank all the time. And I loved the fact that there were bicycles on board, so you could just borrow one and whizz off on a city tour of your own. So, you see, there is a whole world of cruising to explore. And I wanted to tell that lady on the beach in Antigua that she really ought to give cruising a go before insisting that it simply wasn’t for her. I was that woman once. And look at me now… counting the days until I step on board once again and set off on another adventure. Cruises are all about going in with an open mind, and putting in what you’d like to get out of them. There’s plenty to do for everyone! Great post! Loved this – and agree entirely – always something to suit everyone cruising!